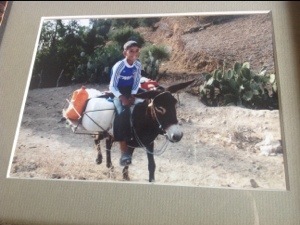 The little boy rode for miles, his plastic water containers strapped behind him on the back of the donkey. His eyes’ gaze held the years of a much older man, but his gentle smile reflected he was still a youthful boy. He was just doing his chore, his part, his job. He carried jugs of many shapes and sizes. The dirt road was dusty, and rocks and pebbles found new homes along the path as the animal’s hooves rearranged them with each plodding step. The road was hot from the burning sun, its heat permeating to the core of everything it touched. Unless he was fortunate enough to travel in the shadow of a mountain or to pass by the occasional, sporadic overgrowth of bushes and trees, shade was elusive. It is summer so the landscape lends itself to be vulnerable to the elements, but the journey in a different season would display the beauty of the terrain. As he reaches the water well, he waits his turn. He is mindful of his task, but welcomes the opportunity to visit with the others preparing to transfer the life-sustaining sustenance from the well to their vessels. The containers are filled to the brim and caps are tightened securely. They are then placed one by one into the homemade wooden cart that has been fastened on the animal’s back. There is no room for error; the journey is too long to be careless. Slow and steady wins the race. The boy is careful to stay on the path and not to allow the donkey to stray into the underbrush. Snakes and other crawling creatures of the earth might be awaiting, ready to startle. His other challenge will be the steep incline up the hillside groove that marks the way to his village. He always secretly feels like a hero when he arrives home. He knows it is just a chore-part of the daily routine, but he knows his contribution is a vital one. Not only will his family drink the water, his umma will use it for preparing his family’s meals. As he rewards himself and his helper with a long guzzle of the newly-collected soothing liquid, he is already envisioning the couscous, tajine and harira that awaits him as his umma prepares the evening meal. This entry was posted in Life and tagged couscous, umma, water, well. Bookmark the permalink. Sounds as if you’ve been there!